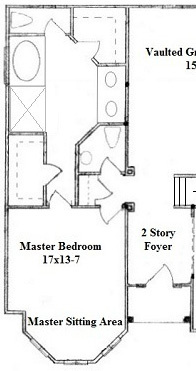 Looking for master suite layout ideas? 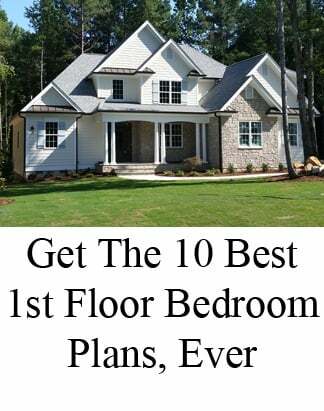 Our top 5 master suite designs for new homes are packed with unique details, cool architecture, and one-of-a-kind custom designs. 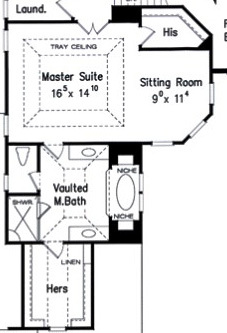 This version of the Dugan floor plan features a first floor master suite with second floor mother-in-law suite. 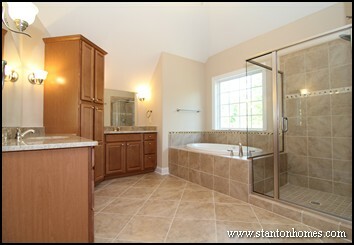 - Walk in Closet is located on the opposite side of the bath. 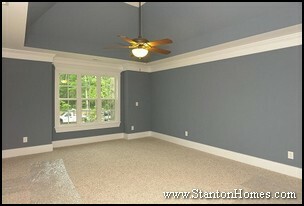 The Dugan is copyright Stanton Homes. The Summerlyn is copyright Frank Betz. 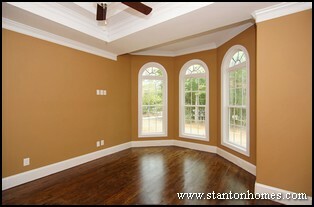 The Lowery is copyright Stanton Homes. 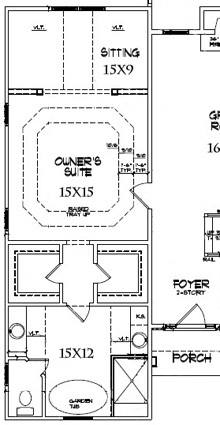 The Mastrosimone is a first floor master suite floor plan. 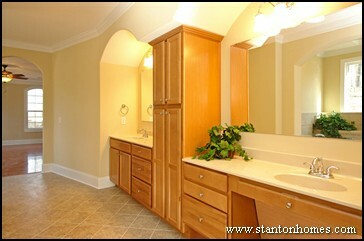 The his-and-hers walk in closets sit opposite each other, and lead into the master bath. 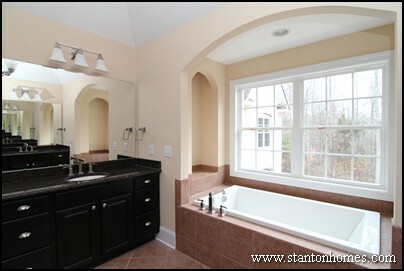 A centerpiece soaking tub pulls together the parallel design. The Mastrosimone is copyright Planworx Architecture. 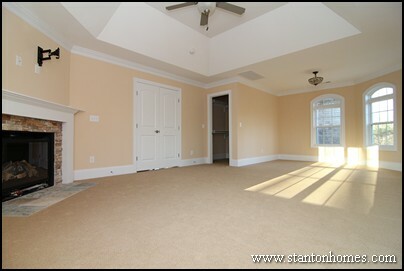 All four bedrooms in the Penelope are located on the second floor. 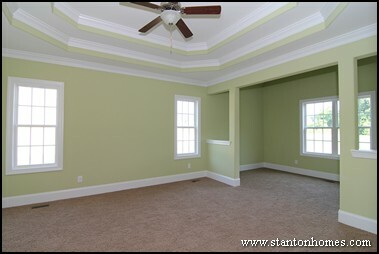 The Penelope is copyright Stanton Homes. 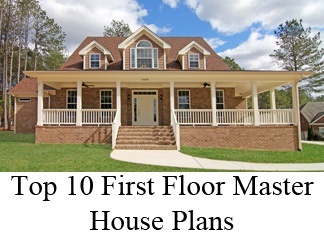 When building a new home, North Carolina home buyers rank plenty of storage space throughout at the top of their wish lists - including in the master bathroom. What master bath features are most important to you? 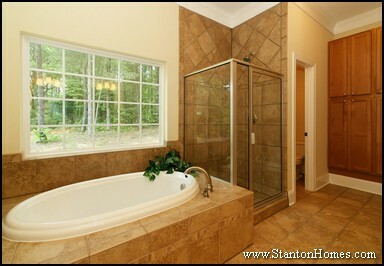 Your master bathroom should be designed with all the features you love - with luxury, comfort, and convenience in mind. 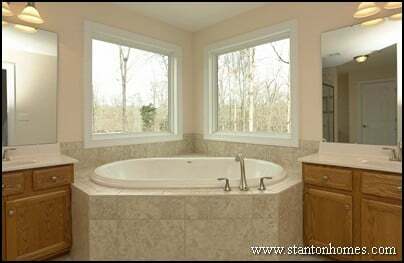 Get ideas for how you can de-clutter your space in these favorite master bathrooms. Our top 6 designs, each with one-of-a-kind cabinet storage designs, are pictured below. 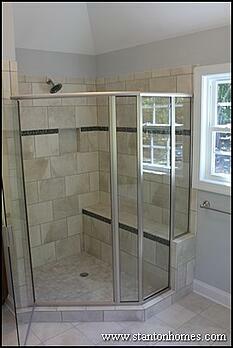 Want to display towels, toiletries, or knick-knacks in your master bath, without giving up valuable storage space? 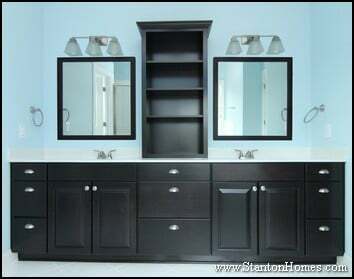 The custom built vanity in this version of the Carwile maximizes the storage space in this "his and her" style bathroom by adding an open shelving unit above the counter. 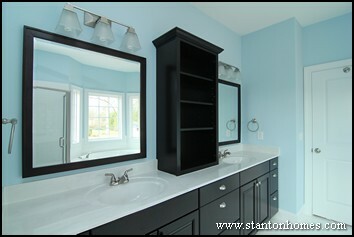 The open shelves are designed to display hand towels and toiletries. 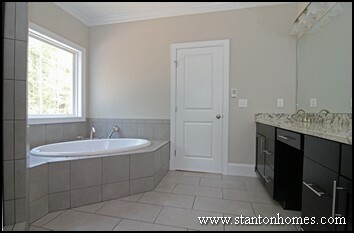 Larger bath towels fit into the 24" wide stack of drawers located below the open shelves. Tip: White or pale blue towels will really pop against the espresso shelves. 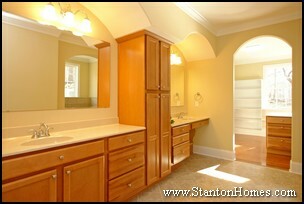 A larger master bath floor plan can allow more creativity when designing your storage cabinets. 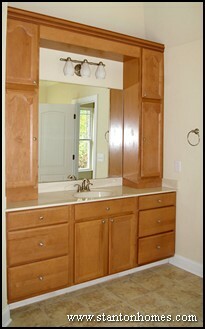 Consider including a full-height storage/line cabinet between the his-and-hers vanities. 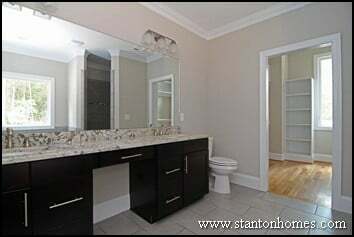 Another option would be to include an open knee space with a third mirror where the full cabinet is located. Tip: Store light-weight and less frequently used items in the upper cabinets, such as linens and spare towels. 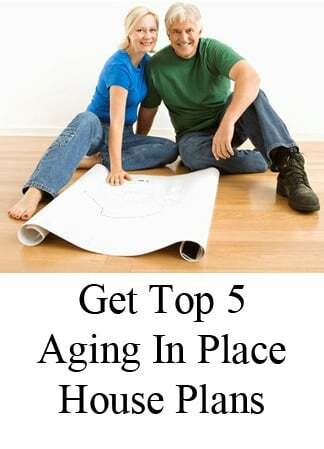 Store heavy and tall items in the vanity cabinets and drawers, such as Costco-size shampoo and toiletries. Make use of a wall and add tons of storage by tucking a full-height linen cabinet into a wall. This efficient storage idea can work in small or large master bathrooms, saving a ton of space and opening up the floor plan. 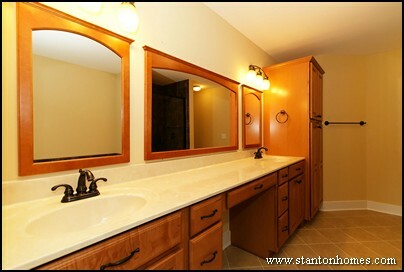 Store your daily toiletries in the vanity cabinets. Use the tall cabinets to store larger items. 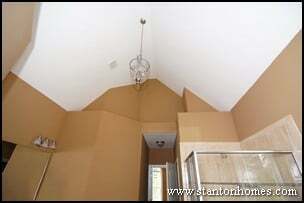 The top of the cabinets also serve as a plant shelf and display area. Tip: If you're short like me, keep a stool tucked nearby to be able to reach the upper cabinet! 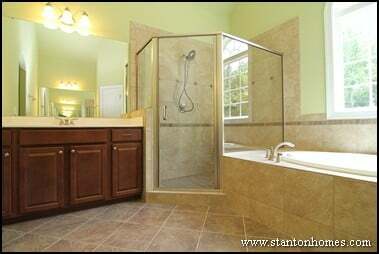 Another master bath storage idea is to include an open knee space below the his-and-hers vanities, with a full-height cabinet tucked to one end. Under-counter knee space is perfect for a make-up or prep area. Just tuck in a chair. 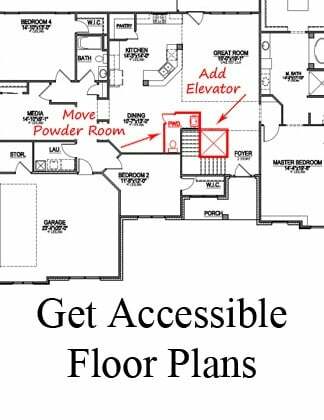 Tip: Knee space can also be converted into a storage area. 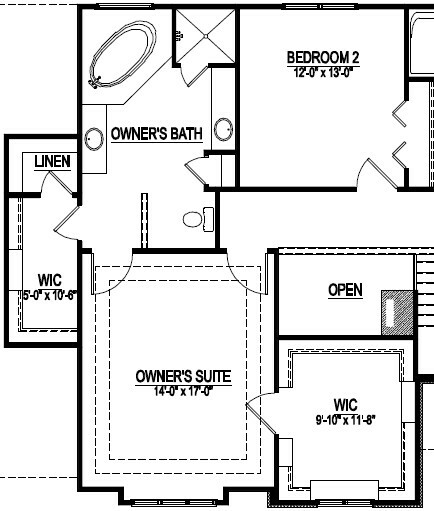 Measure the width and height of the open space, pick up a good size wicker basket, fill it with towels, and store it underneath. An angled upper cabinet is the ultimate space-saver accent, especially in a master bath with a vaulted ceiling and multiple walls coming together. The top of the cabinet doubles as a decorative plant shelf. Tip: If you need daily access to a small toiletries, this high-end storage unit can serve as your medicine cabinet. 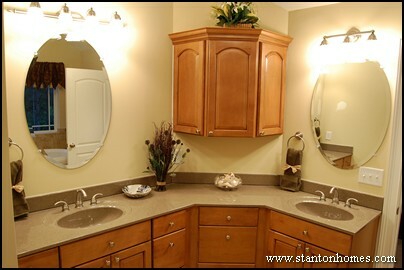 A master bathroom with only one vanity can still be designed with tons of storage space. 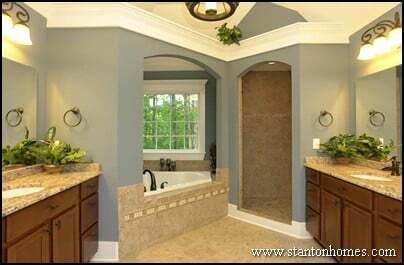 This master bath features wrap-around cabinets with an upper plant shelf. 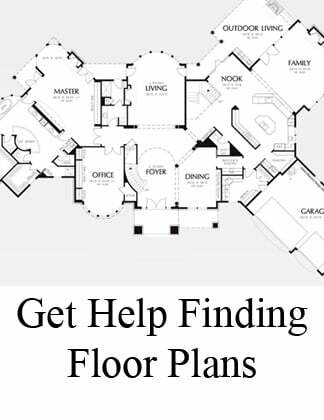 Tip: Wrap-around cabinets can give your master bathroom personality without losing efficiency - no matter what the floor plan looks like. 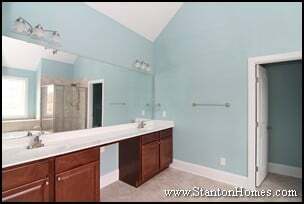 When you build a custom home with Stanton Homes, you get to decide exactly how much storage space is right for your lifestyle. 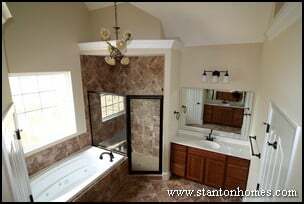 See one example of how the master bathroom design process works when you build a Stanton Home - from hand drawn layouts to finished custom homes. Get even more master bath storage and design ideas, in these Pinterest photos.